< Fly fishing the tail-out section of a steelhead tributary is fundamental to successful steelhead fly fishing whether you are dead-drifting egg patterns and nymphs, stripping streamers and wooly buggers or swinging spey flies downstream. Steelhead will often use this area of a tributary water flow for resting and holding due to the current breaks that exist there. Whether the steelhead fly fisher can expect good numbers of steelhead to hold in pool tail-outs depends on a variety of factors including water temperatures, water clarity, water flow and the fall, winter or spring seasons. In the lower end of a typical tributary stream pool the streambed eventually levels out from a higher gradient at the upper part or the head of the pool (see Figure 4.0 in John Nagy's book Steelhead Guide, Fly Fishing Techniques and Strategies for Lake Erie Steelhead). 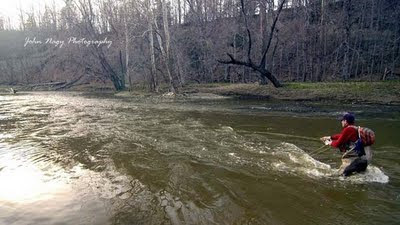 This causes the current to slow down, creating a current break ideal for steelhead resting and holding. Steelhead will especially take advantage of this current break in the fall/winter transition period of October and November when water temperatures range in the 38-45 degree F.
At the very end of the pool (the upper pool tail-out), the streambed starts to rise abruptly. Here even slower currents are found due to the current flow being deflected and dispersed upward (and to a lesser extent to the sides) making it slow down for a short distance. If you look carefully at this point you can see the water rise slightly due to the deflection of the current. As the streambed levels off again, the current picks up speed very quickly, forming a faster but rather shallow flow of water. This area is called the lower pool tail-out. 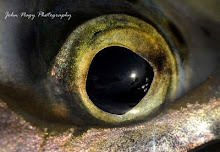 Most steelheaders realize that during high water conditions steelhead will drop down in a pool since it requires less energy to hold in slower currents. In the fall months of September and October (water temperatures above 45 degrees F) steelhead are much stronger and can hold in the faster currents in the upper part of a pool as well as the lower pool tail-out where the flow becomes shallow and faster. Some steelheaders are not aware of the lower pool tail-out holding location of steelhead in the fall. Here, classic nymphing or short line bottom bouncing (with or without a floating indicator) is very effective for catching strong, energized fall steelhead. The steelhead fly fisher will discover that good numbers of steelhead will locate in this shallow, fast water in the fall especially if there is some stain to the water. The stain gives the steelhead good cover and a sense of security and comfort in the shallow water. It also allows the steelheader to wade in close proximity to the fish without any danger of spooking them. In the ice water temperatures of December through February (32-37 degrees F) steelhead become lethargic and prefer the slower current areas at the end of the pool. They particularly like the upper pool tail-out section where some of the slowest current in the pool exists. Here floating indicator fishing allows for precise presentations with flawless drag-free drifts for fussy winter steelhead that rarely move for a fly. Often a vertical structure such as a rock or shale ledge, boulder or gravel bar exists in the pool tail-out creating a slight current break for winter holding steelhead. 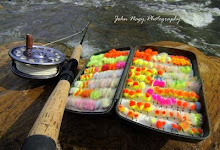 Using the “right angle” floating indicator technique (keeping the float, tippet and fly aligned vertically in the water column during the drift) is a very effective method for drifting along these structures. The traditional approach of swinging a fly in the downstream current direction in a down-and-across manner is a very effective way to cover steelhead holding areas in a pool tail-out. In higher flows, swinging a fly through a tail-out is easily done due to the faster current speeds. If the water is too fast a few upstream mends of the fly line on the fly’s swing will slow the fly down a bit and allow it to drop down to steelhead holding in the tail-out. As the water drops and the current slows in a pool tail-out, steelhead will move up in the tail-out and often the steelheader is required to help his fly along in the swing due to the slower current speed. This is accomplished by a downstream mend or mends of his fly line on the swing, which allows his fly to pick up speed on the swing and move more quickly across the tail-out. A pool tail-out section is a magnet for steelhead when it is located above a long series of rapids, runs and boulder strewn pocket water. After working their way up through these faster flows and stream obstacles steelhead will quickly hunker down in a pool tail-out and use it as a resting and holding area. This is especially true in higher tributary flows and during the cold tributary water flow months of late October through March. 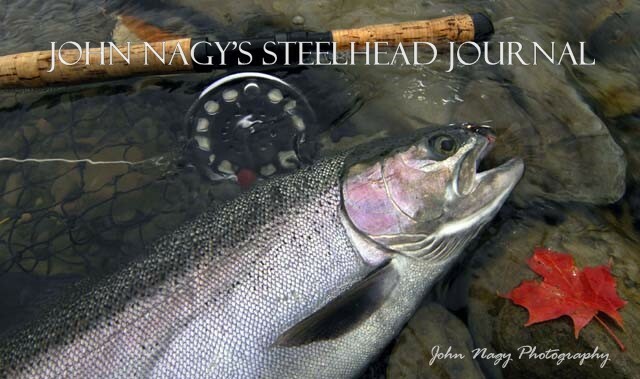 More detailed information on fly fishing for Lake Erie steelhead can be found in John Nagy’s book “Steelhead Guide, Fly Fishing Techniques and Strategies for Lake Erie Steelhead”.